Ken Buera (Calgary, AB) is a recent graduate of The Alberta College of Art & Design. 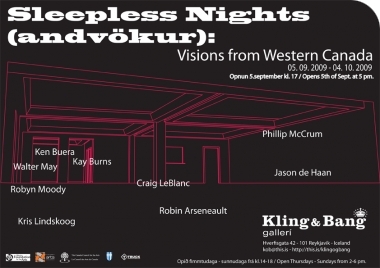 His audio, video and collaborative works have been shown in Calgary, Open Call at the Southern Alberta Art Gallery in Lethbridge, Signal+Noise in Vancouver, D’ouest en Est at AxeNeo7 in Gatineau, Video as Urban Condition, Austrian Cultural Centre in London, and Rencontres Internationales in Paris. He is active in the local Artist-Run centre community as a volunteer and a Board Member of TRUCK Gallery, and has recently participated in the Sound & Vision Thematic Residency at the Banff Centre. Kay Burns is a multidisciplinary artist who shares her time between Alberta, and Newfoundland. Her processes include work with audio, imagery, computer/electronic installation, locative-media, and performance art. She has a strong interest in collaborative practices. She is a founding member of the Ministry of Walking (a collective involved in the practice of walking within individual and collaborative art explorations) and has been involved with the EMMAX collective (audio performance group). Her work has been presented at venues nationally and internationally, including Art Gallery of Alberta, Walter Phillips Gallery (Banff), St. John’s Sound Symposium (Newfoundland), Catalyst Arts (Belfast), and Venturous Vanguard Video Festival (Los Angeles). She is also a freelance curator and writer. She was the curator at the Muttart Public Art Gallery (now called the Art Gallery of Calgary) from 1995–1999, and she taught for 10 years through the University of Calgary Art Department and the Alberta College of Art & Design Media Arts and Digital Technologies Department. Jason de Haan (Calgary, Alberta) has shown his work in group exhibitions in Canada, United States, Ireland, Sweden, and Britain. Recent solo projects have been presented at Stride Gallery (Calgary, AB), Galerie Sans Nom (Moncton, NB) and Lump Gallery/Projects (Raleigh, NC). Upcoming exhibitions include Museo Ciudad de la Ciudad (Querétaro, Mexico), and Clint Roenisch Gallery (Toronto, ON). Jason is a member of the collective Unconstrained Growth Into the Void and, with Scott Rogers, is the co-founder of the curatorial initiative Pocket Projects. Craig Le Blanc (Calgary, Alberta) received a BFA from NSCAD University, studying painting and sculpture. Over the past decade Le Blanc’s practice has shaped a diverse collection of objects and installations investigating popular culture’s representation of athletes and the arts. His practice has evolved from the relationship of sport, play and leisure to the exploration of concepts relating to artists, athletes, corporate involvement, mass media, the spectator and social identity. This progression has formed the work we see today, questioning the placements of sport and art within western social, economic, and cultural contexts. He has exhibited extensively throughout Canada, and is currently part of the national touring exhibitions Burning Cold and Arena: The Art of Hockey. Working with text, wordplay, anagrams and colour, Kris Lindskoog (Calgary, Alberta) creates drawings that offer wisdom and advice through often humourous phrases and imagery. Kris graduated from ACAD in 2001 and lives and works in Calgary. His work has been shown locally and nationally, most recently with SEARCH PARTY!!! an installation at Artcite in Windsor, Ontario and in PENNED, a group show of drawings at the Pinkard Gallery in Baltimore, Maryland. Since 1982 Walter May (Calgary, Alberta) has been a faculty member at the Alberta College of Art and Design. He has taught in both the Sculpture and Foundation programs. Although Walter May is primarily known as a sculptor, he has also produced drawings, as well as installation and performance art. He has had fourteen solo exhibitions across Canada, and participated in numerous local, national and international group exhibitions. May has been the recipient of several Canada Council Arts Grants, and is represented in such public and corporate collections as Alberta Foundation for the Arts, Canada Council Art Bank, Glenbow Museum, University of Lethbridge, Toronto Dominion Bank, and PanCanadian Petroleums, (now ENCANA). Walter May is currently a practicing studio artist who exhibits at Paul Kuhn Fine Arts in Calgary. May is a member of the Sculpture Department at the Alberta College of Art and Design (ACAD), and the President of the Faculty Association at ACAD. Phillip McCrum (Vancouver, British Columbia) has worked in the western Canadian arts community since the 80’s in a variety of capacities: Curator of the OR Gallery, Co-editor of BOO Magazine, and board member of several Artist Run Centres. In addition to this experience, McCrum has participated in a studio residency funded by the City of Hamburg Art Council and has taught courses at a number of institutions including University of Lethbridge, University of Ulster (Belfast) and Hangzhou University of Commerce (China). He currently teaches as a Lecturer in the Faculty of Fine Arts at the University of British Columbia. Interdisciplinary artist Robyn Moody (Calgary, Alberta) takes a whimsical and multifaceted approach to artmaking, incorporating electronics, film, performance, installation, sculpture, or whatever a project requires. He holds an MFA from NSCAD University in Halifax, Nova Scotia and has exhibited his work extensively across Canada, and somewhat less extensively in Europe. In his free time he teaches at the Alberta College of Art and Design. The Second Story Art Society (operating as TRUCK) is a non-profit artist-run centre dedicated to the development and public presentation of contemporary art. Since it was founded in 1983 the Society has facilitated over 350 exhibitions in addition to countless activities and events in support of cultural development and contemporary art appreciation. Currently, TRUCK hosts 15 exhibitions annually in its two exhibition venues, and various collaborative events and activities with other arts groups and nonprofit organizations. Although TRUCK supports a full spectrum of artistic practices, programming generally focuses on hybrid and emerging forms of contemporary art that situates the work of Calgary artists in a national context. Through the presentation of regional, national and international contemporary art, TRUCK contributes to the development and understanding of contemporary art within the Calgary community.